The Whistler, by John Grisham, was a book I couldn't put down, I needed to know what was going to happen next! Hey Laurel, I know the feeling. There were several Grisham books that kept me up past my bedtime. Unfortunately, I am an "early-to-bed-early-to-rise" person and always have been. So, nothing keeps me up. However, I admit that I often wake up in the middle of the night and think about books I'm reading. 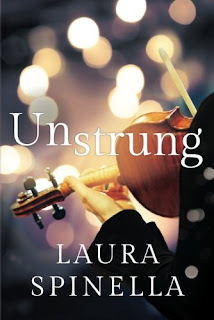 I found "Unstrung" to be an fabulous book and would honestly love to see it made into a movie. Hi Connie - I couldn't agree more. "...but like a Russian nesting doll there are secrets hidden beneath the layers." Those might be my favorite words I've read regarding Unstrung. Thank you so much for reading, and posting such a thoughtful review. It's very much appreciated! I loved reading your book. You were a-new-to-me author and I'm happy to have discovered you and your backlist. WOW - this review blew me away. Thanks for the introduction to this author and this book. The last book which kept me up at night was Four Nights With The Duke by Eloisa James. That book just hit the spot for me. Hi Annette - I think you will enjoy this book and this author. Great review! Will have to check this book out. Last book that I've read that kept me up was Starlight Bridge by Debbie Mason. Oh gosh - another book I'll have to check out:) So many books, so little time. In truth, 90% of what I read is based on recommendations, so I'm happy to hear about this book - thanks. I love, love, loved Debbie Mason's Starlight Bridge! She's a auto-buy for me. I added Unstrung to my wish list, Maria. It sounds fascinating. I loved Debbie Mason's Starlight Bridge too, but the most recent book I read that kept me up into the wee hours was an ARC of Emilie Richards's The Swallow's Nest--a women's fiction novel about three women who want the same little boy--the biological mother who gave him up, the wife of the child's father who loves the boy despite his being a living reminder of her husband's infidelity, and the boy's paternal grandmother who sees the boy as a way to correct the mistakes she made as a mother. It was riveting and wrenching, and I can't stop thinking about it. I'll probably read it again before I write the review.